Papillon also called the Continental Toy Spaniel, is a breed of dog of the Spaniel type. The origins of the Papillon (French for butterfly) go back centuries in Europe. Papillons were the darlings of royalty in France, Italy, Spain, and even Poland as early as the 1500s. Marie Antoinette was a Papillon owner, as were Madame Pompadour, Louis XIV, and numerous other notables. Dogs looking very similar to today’s Papillons are in works of the old Masters, including Boucher, Fragonard, Watteau, Rubens, and other artists. Henry III was so infatuated with his dogs that he named the breed the official dog of the Royal Court. Papillons were first known as Epagneul Nain or Dwarf Spaniel. The Papillon dog breed today is a fineboned, elegant toy dog, with a happy, alert, and friendly disposition. The height is between 8 and 11 inches, and the weight is between 5 and 10 pounds. The body is slightly longer than the dog’s height at the shoulders. The head is carried high and attentively, with dark, round, but not bulging, eyes. The ears are the breed’s crowning glory and are large, erect, and feathered with long coat. The ears should look like butterflies. There is a drop-eared version called Phalene, and the ears are the same size and proportion as the erect ear. 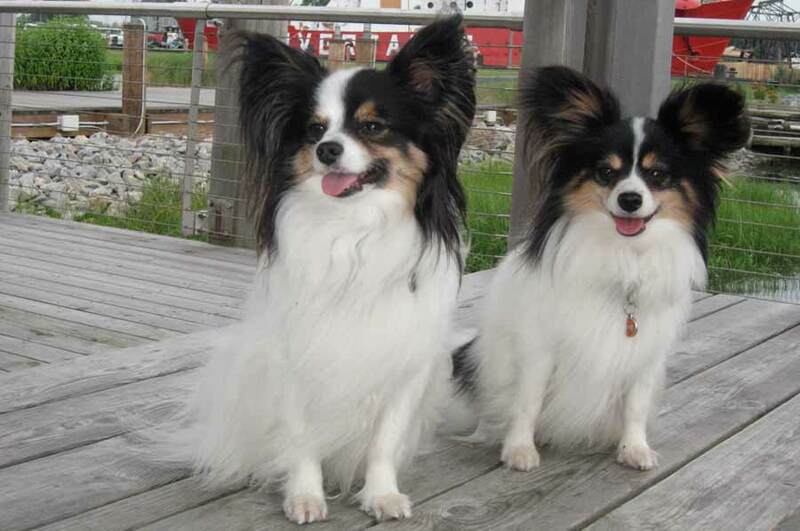 The Papillon’s coat is long, fine, and silky, and there is no undercoat. The base color is always white, with patches of color. The ears and around the eyes must be a color other than white. The Papillon’s lovely silky coat can become matted if it is not brushed and combed every other day. If the dog gets wet (which most Papillons detest), she should be blow-dried and combed to prevent matting. Papillons are active little dogs and need daily exercise. This can consist of a walk morning and evening, with a playtime in between. Luckily, the breed’s small size makes playtime easy. A ball tossed across the room for the dog to retrieve can become an exciting game. But don’t let the breed’s small size fool you; these little dogs also make great agility dogs and flyball competitors. Papillons love to play games of any kind. Socialization and training should begin when the dog is young. Papillons are alert little watchdogs, and barking can become a problem. With socialization, they can learn who to bark at and who not to, and training can control the tendency to bark too much. Intelligent dogs, Papillons also need training to challenge their minds. They have excelled in obedience competition, tracking, and many other canine sports. Papillons are good with the elderly, as they are easy to exercise, are friendly, and, after a game, are willing to cuddle. Although they are usually also friendly with children, they are too fragile for kids who play rough. Most Papillon breeders will not sell Papillon puppies to a family with children under the age of 8 to 10 years. Papillons are also good with other dogs, although interactions should be supervised so that the Papillon isn’t injured by rough play. They are good with cats, but interactions with small pets should be supervised, as some Papillons are natural mousers and ratters. Health concerns include knee problems, dental problems, and eye disorders. Share your Papillon ( Continental Toy Spaniel ) story. Note: Upload only Papillon ( Continental Toy Spaniel ) picture or your picture with Papillon ( Continental Toy Spaniel ) below - spammer's ip may be blocked.